According to ANI, sources are to question whether India will take up the case of IAF pilot through diplomatic channels and or the United Nations (UN). New Delhi: The Ministry of External Affairs (MEA) on Wednesday said one Pakistan Air Force fighter aircraft was shot down by the Indian Air Force (IAF) this morning. However, in this engagement, the IAF lost one MiG 21 and a pilot was missing in action. Though Pakistan has claimed that the pilot is in their custody, MEA spokesperson Raveesh Kumar said the ministry was ascertaining the facts. Air Vice Marshal RGK Kapoor was also present at the briefing. 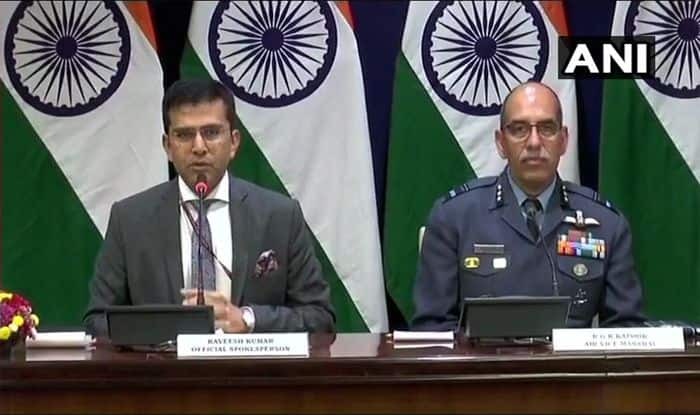 According to ANI, sources said it was not clear if India would take up the case of the missing IAF pilot through diplomatic channels and or the United Nations (UN). It is being said that Pakistan had not formally informed India about the detention of the pilot which it claimed to have in its custody. Earlier in the day, Pakistan military had claimed to have captured two Indian pilots after shooting down an IAF jet. Head of the media wing of Pakistan’s military Major General Asif Ghafoor said one of the pilots was hospitalised and was being treated for injuries. The development came just after India shot down a Pakistani F-16 jet that violated the Indian air space in retaliatory fire 3 km within Pakistan territory in Lam valley, Nowshera sector. Earlier, Pakistan had claimed to have entered the Indian airspace and dropped bombs. Senior government officials said there were no reports of any casualty. A parachute was reportedly seen when the Pakistani jet went down but the fate of the pilot is unknown.